MOSCOW, September 14. /TASS/. 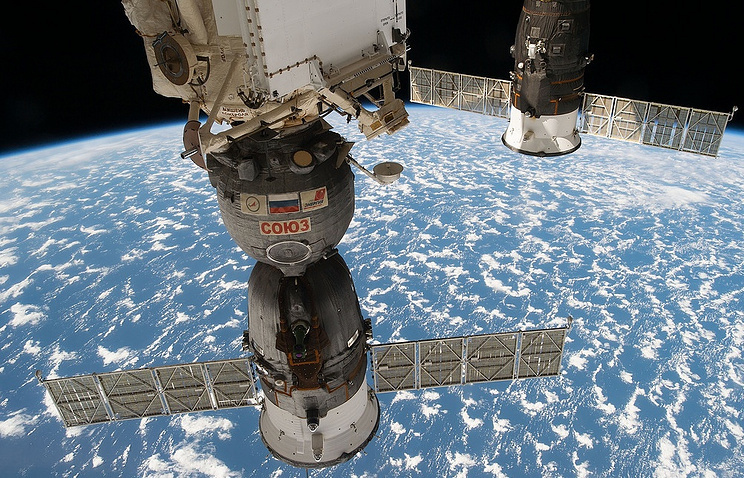 Specialists have found new traces of drilling in Russia’s Soyuz MS-09, a spacecraft docked with the International Space Station (ISS) where an air leak was earlier reported, a rocket and space industry source told TASS on Friday. "Traces of drilling have been found not only inside the spacecraft’s living compartment, but also on the screen of the anti-meteorite shield that covers the spacecraft from the outside and is installed 15 millimeters away from the pressure hull," the source said. A drop in pressure due to an air leak was detected on the orbital outpost overnight to August 30. Later, the cause was discovered to be a two-millimeter hole of the orbital compartment of the manned Soyuz MS-09 space vehicle docked to the space station. Russian cosmonauts had plugged the hole patching it up with several layers of epoxy resin and restored pressure aboard the space station. The space industry source told TASS that before the hole was sealed, the cosmonauts conducted photo-and video surveillance of the hole with an endoscope. "During the analysis of those images, traces of drilling were found on the anti-meteorite shield," the source said, adding that "the top of the drill came through the pressure hull and hit the non-gastight outer shell." According to another industry source, the non-gastight anti-meteorite protection is installed right before the spacecraft is taken to the final assembly workshop. "When Soyuz MS-09 has just arrived to the final assembly workshop, it was photographed in details. No hole and no signs of drilling… were found. The spacecraft was drilled later, when it was fully assembled," the source said. He added that the anti-meteorite shield was also photographed before being installed, and no traces on it were found as well. 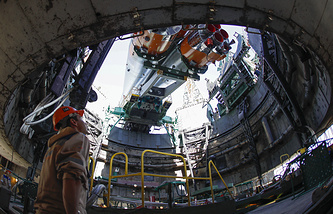 The source suggested that the spacecraft could be damaged either during the very last stage of works or during its 90-day stay in the checkout stand, adding that it was highly unlikely that the damage occurred during the transportation to the Baikonur space center in Kazakhstan or at the launch facility. TASS has been unable to officially confirm the information, provided by the sources, at the time of the publication. The commission ended its investigation last week, all files were submitted to Roscosmos. According to state corporation’s director general, Dmitry Rogozin, Roscosmos experts will study the materials "for as long as it takes," but "within reasonable limits." On Wednesday, Rogozin held a phone conversation with NASA chief Jim Bridenstine. The sides confirmed the need for further close interaction between Roscosmos and NASA experts in identifying and eliminating the causes of the air leak. Rogozin and Bridenstein also agreed that NASA will assist Roscosmos in the investigation.